At the EM, we love music! 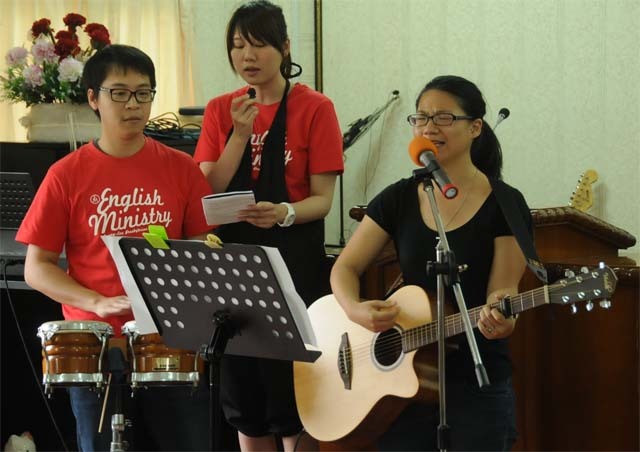 Whether it’s singing those older hymns that connect us with the history of the church and the generations of Christians who have gone before us, or turning up the energy levels with modern praise and worship. Whatever the style, we get together to have fun worshipping God! That’s why at the EM we have two teams focused on praising God through music. The EM choir is a group of all ages that practices together after the service every week. We sing in the service on the 3rd Sunday of the month. The Choir’s focus in on giving everyone a chance to have fun while singing. So if you love praising God in a team with others, come join in! All are welcome! The EM Praise Team specializes in contemporary Christian music, with a modern feel and an upbeat, energetic service style. We lead the EM service on the 1st Sunday of every month. So if you know how to play the piano/guitar/tambourine/drums or like to turn up the energy in worship, come join us!